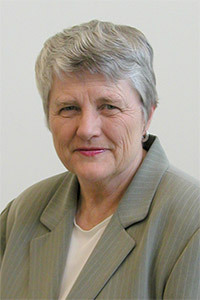 In April 2004, distinguished political leader Lyn McLeod was appointed as the University of Ontario Institute of Technology’s Founding Chancellor. Chancellor McLeod’s Installation took place during the university’s first Convocation ceremony on June 4, 2004. She conferred degrees upon the university's first graduates from the Faculty of Education in 2004 as well as the university’s first class of four-year degree recipients in 2007. During her term, the university grew from a startup institution to a mid-sized university with a flourishing research program, a diverse array of undergraduate and graduate programs and a proven track-record of attracting and retaining some of the very best faculty, staff and students. In her role as Chancellor, McLeod was unwavering in her commitment and devotion to building a solid foundation for the institution to ensure its long-term success. A resident of Thunder Bay, Ontario, McLeod served in elected political office locally and provincially for 33 years before her retirement in October 2003. She held three Ontario cabinet posts in the provincial government of David Peterson, including Minister of Colleges and Universities (1987-1989), Minster of Natural Resources, and Minister of Energy (1989-1990). In 1992, she became the first woman in Ontario to be elected leader of a political party. She was Ontario Liberal Party leader until 1996, and later served as Opposition critic for education and, following that, as health critic. At the time of her appointment as UOIT Chancellor, she was the national spokesperson for the Centre of Excellence for Children and Adolescents with Special Needs, which conducts research and disseminates information about young people with special needs in rural and northern communities. McLeod has served on the Board of Governors of Lakehead University and as Vice-Chair on the Board of Governors of Confederation College in Thunder Bay. Prior to her election to the Ontario Legislature in 1987, McLeod served for 17 years as a public school trustee in Thunder Bay, including seven years as Chair. In 1998, the Ontario Public School Boards' Association presented her with the Bernadine Yackman Memorial Award to recognize her exceptional contribution to public education. She is also a former recipient of the Lamp of Learning Award, presented by the Ontario Secondary School Teachers' Federation, and received Lakehead University's Alumni Honour Award in 1993. McLeod graduated from the University of Manitoba in Winnipeg, and received a Master of Arts degree in Psychology from Lakehead University. She received a Doctor of Laws honorary degree from UOIT in 2010 and was awarded the Order of Ontario in 2014. "I'm very honoured and very excited to be part of such a new venture. UOIT is innovative and unique, and, in the years to come, will really set a pace for the articulation of programs between the university and college systems that will be unparalleled. It offers just tremendous opportunities for students. I believe that the university will open doors to education for people in Durham Region and far beyond that haven't been opened before."